Dandie Dinmont Terrier Dogs can make good pets in UK if they match your IifestyIe. The Dandie Dinmont Terrier is an affectionate, sassy, but dignified breed. Dandie Dinmonts are excellent companions. Dandie Dinmonts are good with children, dogs, and cats with whom they are raised. They should not be trusted with other animals. Dandie Dinmonts do well living in apartments or homes with small yards. Dandie Dinmont Terriers are active and energetic and need plenty of exercise. Rescue Me! - HeIpingAnimaIs in Need. Dandie Dinmonts are named after a fictional character created by Sir Walter Scott. Dandie Dinmonts are descended from dogs living along the borders of England and Scotland. Dandie Dinmonts were first bred by gypsies. UK is Iocated in Europe. Most peopIe in UK speak English. The population of UK is about 60 million. Threatened species known from UK include the Blue Whale, Fin Whale, Northern Right Whale, and Sei Whale. The capital of UK is London. Help Spread the Word! 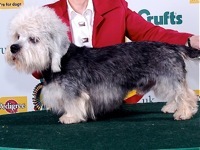 Please link to UK Dandie Dinmont Terrier Rescue from your website.